You’re the ruler of a great empire, doing your best to pillage every village and set fire to any nation who doesn’t bow down to you. Mass murdering your way through a continent takes a lot of food, money and good men. Eventually if you’re not careful you might spread your provisions too thin and lose the Empire in the effort of expanding your reach. This is where Bread and Circuses come in to play. Rome did not fall because of an invading force, Rome eventually fell from the inside. It didn’t happen quickly, as more rations were sent off to the soldiers, food supplies started to dwindle. more and more sons, husbands and fathers were being sent off to fight and die for the sake of expanding an already massive nation, families became impoverished, and the people got restless. The leaders of Rome, seeing the beginnings of a potential revolt had to act accordingly. Their decision was to give out rations of Free Bread and put on Circuses as well as other events open to the public. Their logic was to keep the masses entertained, and distracted from the fact that their home and empire was falling apart. Though mindless entertainment and belly feeding may prolong the ailment of a corrupt empire, it isn’t a cure. Rome unable to Rule their people well, keep trying to conquer the world and eventually spread their resources and people to thin and came crumbling down. 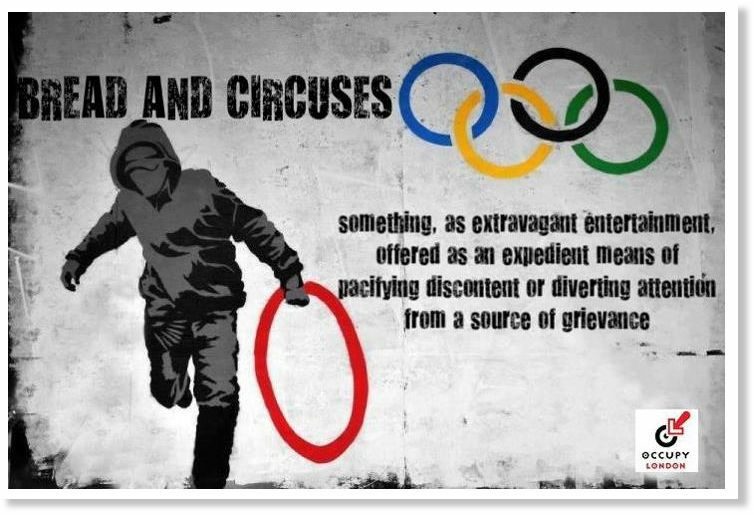 Where can we see Bread and Circuses being used in today’s world? What are our leaders distracting us from?